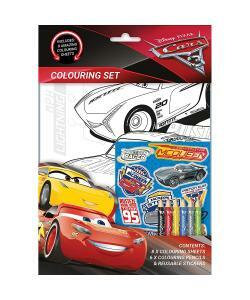 Let your child get creative with this cars 3 colouring set. This fantastic set includes colouring pencils and reusable stickers so that you can bring your designs to life. You can customise your books, bags and gadgets with these reusable stickers to create cool new looks. With lots of colouring activities to do you can be assured that your child will have lots of hours of fun and creativity with this colouring set. The perfect gift for any young fans of cars 3. Not suitable for children under the age of 3.